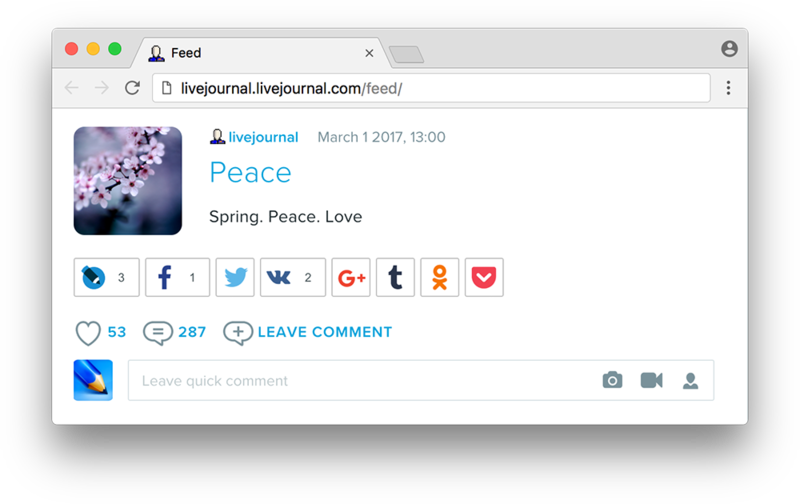 On April 15, 2017, LiveJournal is turning eighteen. 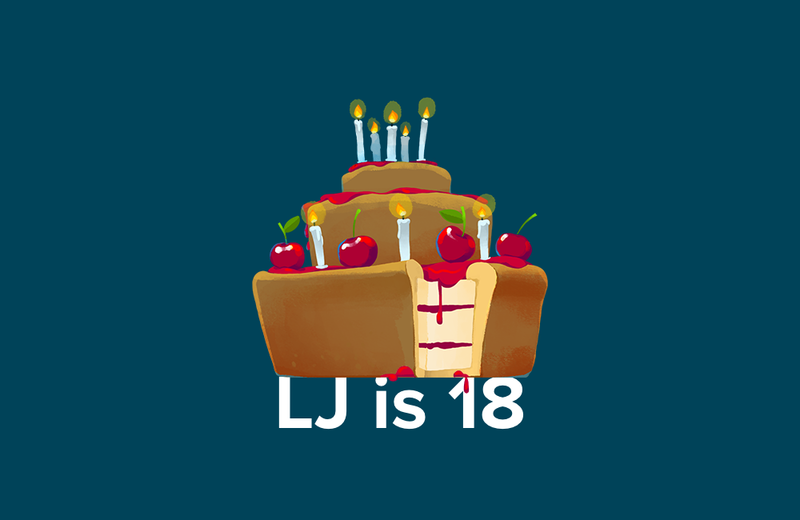 In fact, LJ has two birthdays: March 18, 1999 (when Brad Fitzpatrick published his first post) and April 15, 1999 (when he registered livejournal.com domain). We're pleased to announce the quick comments feature which allows you to comment on your friends' entries directly from the Friends Feed. To comment on an entry, just type your comment in the box provided and press Enter (this doesn't reload the page, so you can just continue reading your feed from your previous position). HTML, images, videos, and mentioning other LJ users by their usernames are allowed in quick comments. You can also edit or delete the quick comment you left directly from the Friends Feed. This feature is available in the new design and new Feed only. You can switch to the new design by clicking the link in the upper right page corner, and the Friends Feed is available at http://username.livejournal.com/feed/ (where 'username' is your LiveJournal username). We're looking forward to hearing your feedback! At long last, we're pleased to announce a new feature. Now, in journal and community entries, there's a button you can click to show the author you liked their entry. We aim to make feedback to authors easier and quicker, as users don’t always have time to come up with a long comment, while short ones (like “+1” or ”cool photo”) often make us feel awkward. Yet it’s so important that authors receive feedback from their readers! Pressing the heart button is simple - it's like waving your hand to a friend, saying "Hi there, I read you! ", or writing "Great post, thanks". This can often be the motivation for our favorite authors to write more. users with paid accounts can view their feedback statistics. We have released new LiveJournal app for iOS. It's available for free (for devices on iOS 8 and higher). This is a totally new mobile app - modern, convenient and of high standard for iOS apps. Explore LJ without even having to log in or register - all you need is download the app. Unique tree-structured comments system allows you to keep track of all important discussions. And it's fast, too! Publishing your posts, downloading feed, crossposting to social networks - in a flash. The data is cached, which means no connection break will prevent you from reading entries and comments once they've been downloaded. And while you're offline, you can write and save drafts and post them once the connection is restored. We would very much appreciate your feedback! 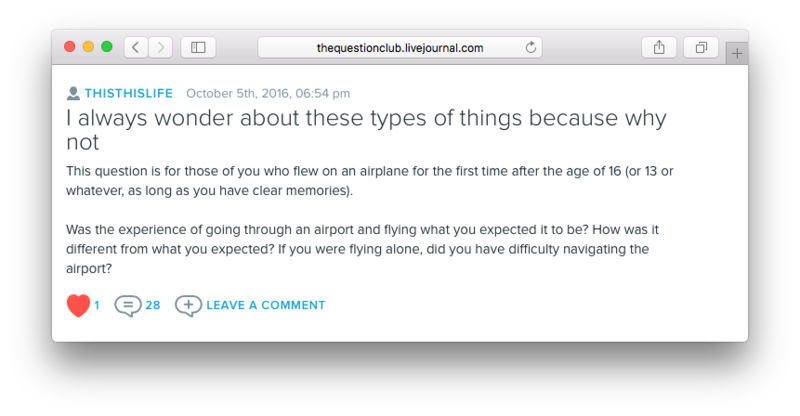 In order to better accommodate mobile device screens, mobile web browsers will now display journals in LiveJournal's default style, Air. This style is optimized for use on mobile devices, whereas most other styles were designed with the intent of being viewed on a computer's web browser with a much larger screen. This change does not affect how your journal will display when viewed on a computer's web browser; your journal will continue to display using your specified style unless a mobile web browser is viewing your journal. There is an opt-out available for this feature. Free accounts opting-out of using the Air style for mobile devices will still be able to view their own journal in their selected style. Paid & Permanent accounts opting-out of using the Air style for mobile devices will also allow others viewing their journal on mobile devices to see their journal in their selected style. This settings is available on the Display section of the Settings page, and is listed as "Mobile View". When deleting a comment from a user in your journal or community, you will now have the option to delete all comments from that user in that post, or to delete all comments that user has ever posted in the journal or community. The menu for this will appear when you delete a comment, and the boxes for mass deletion are not selected by default. We hope you enjoy the changes, and please let us know if you run into any problems! Today, we've launched an updated version of the site navigation menu! The new menu was designed to be less cluttered, making it easier to get to the pages and features used by most people on a daily basis. The remaining settings and management options, such as the edit profile and manage custom friends groups pages, are now accessible through the Settings page. We're also putting a heavier emphasis on adaptability. The new menu is designed to function well on a variety of different devices, all of which use vastly different screen sizes and resolutions. This will make the site much easier to use from mobile devices, in particular. The new site navigation menu also replaces the navigation strip, which previously appeared on the latest entries and friends pages. 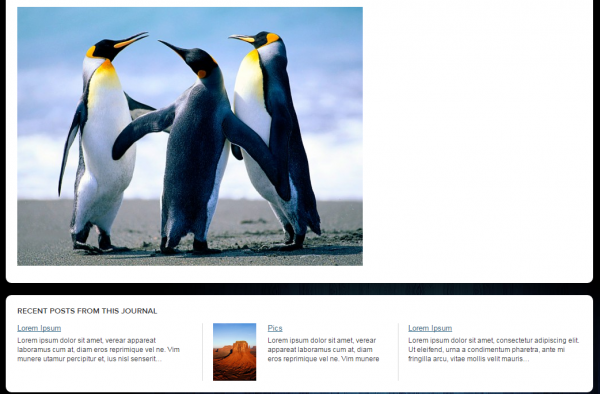 This helps ensure that site navigation remains the same no matter what page you're viewing. We hope you enjoy the changes, and please let us know if you run into any bugs or problems with the menu. Note that the updated menu version is only for the redesigned version of the LiveJournal site. If you are using the older version of the site, the menu changes do not apply. The old version of the friends page (/friends) is not applying friends filters. This will be fixed in an upcoming release. The option for switching to the old version of the site has moved; it is now available as the last option at http://www.livejournal.com/manage/settings/?cat=display. Hi all, we have a few changes to the site to announce today! The new Best Comment feature allows you to pick one comment in your entry and highlight it at the top of the comments section. You can use this to highlight any comment on an entry which you find to be especially interesting, funny, useful, or relevant to the discussion. To select a comment, just click on the green star icon ( ) in the hover menu for the comment. Once a comment has been selected, it will appear at the top of the comments section with a "Best" icon ( ) and will also appear with this icon in its normal place within the comments section. This feature works in both personal journals and communities, but only the person who posts the entry can select a Best Comment. Additional changes to the comment page have also been made to update the icon set which appears when hovering over a comment, and the 'link' function has been moved to the timestamp section. Clicking on the date & time of any comment will take you to thread for that comment. All changes mentioned above only apply to the system commenting scheme; custom comment pages have not been changed. The Related Entries feature has been updated to permit use of friends only entries. If you post a Friends Only entry and select to include the Related Entries feature, it will display both Friends Only and Public entries. If a Public entry is posted, only Public entries will appear in the module. The Related Entries only shows previews of entries that the viewer has access to see. Please note that Custom security level content will not appear in the module; this is to ensure that the module is consistent for everyone when it is viewed. We began using a new captcha provider last week (the "prove you are human" tests). Unfortunately, it was causing issues in several cases, most commonly when custom comment pages were being used or when someone attempted to switch to commenting anonymously. These issues should be fixed now, but we encourage anyone still having problems with these to open a support request with as much information on when problems occur as possible. LiveJournal is now accepting payments in Bitcoin! We have partnered with Coinbase to provide instant and secure payment via Bitcoin to our users! Shop with Bitcoin now and, for a limited time, receive FREE userpics or storage space with any Paid account purchase! 1. Go to the LJ Shop, select any Paid account subscription and add one free gift: 70 more userpics OR an additional 10 GB of storage space. 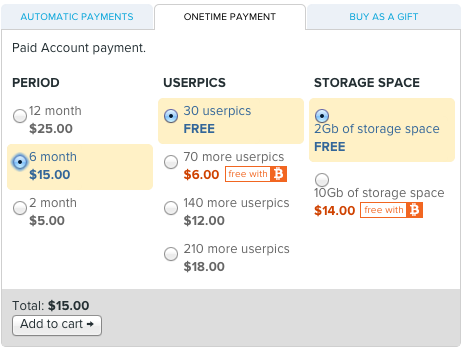 Please note, if you add both 70 more userpics and an additional 10GB of storage space to your cart, only the 70 more userpics will be free. 2. Select "Bitcoin" as your payment method, and click "Checkout". Click on the "Pay with Bitcoin" button. From here, you can choose to pay directly from your Bitcoin wallet by using the generated payment address or by scanning the QR code with your smartphone. Or, if you have a Coinbase account, you can log in and send payment directly. You can also create your Bitcoin wallet in minutes at https://www.coinbase.com/signup. Unrelated to our Bitcoin announcement, we also wanted to announce that it is now possible to quickly delete all comments from a specific user in your journal or community. delete_comments exampleusername from communityname (again replacing both exampleusername and communityname with the appropriate usernames).